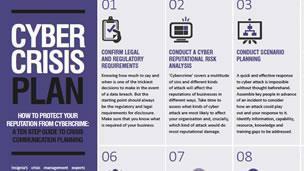 Cyber crime is a fact of life for organisations these days, so cyber crisis planning is essential to ensure that your reputation is protected in the event of a data breach. Being prepared for cybercrime through crisis management planning means you can be confident that you will do and say the right thing under the intense pressure of a cyber attack. It’s not only what your customers, investors, regulators, the media and other stakeholders expect, it will also spare you the reputational damage, financial cost and management time associated with a mishandled data breach. Being prepared for a cyber attack begins with understanding your areas of vulnerability. ‘Cybercrime’ covers a multitude of sins and different types of cyber attack will affect the reputations of organisations in different ways. Insignia can facilitate a cyber risk assessment to assess what kinds of cyber attack are most likely to affect your organisation and, crucially, which kind of attack would do most reputational damage. Thorough cyber crisis preparedness means planning what you would do should a data breach strike your organisation. A quick and effective response to cyber attack is impossible without thought beforehand. Insignia facilitates cyber scenario planning workshops for clients to consider how a cyber attack could play out and the organisation’s response to it. Through this rigorous process we help clients to identify information, capability, resource, knowledge and training gaps to be addressed. Based on your reputational risk analysis and scenario planning, Insignia can develop your cyber incident response plan. This will include the critical first steps to be taken in response to a cyber incident and details of your cyber incident response team; the people who would be central to responding to a data breach. Your cyber incident response plan will also contain pre-prepared crisis communication materials such as template media statements and internal briefings to help you quickly communicate the right messages under pressure.